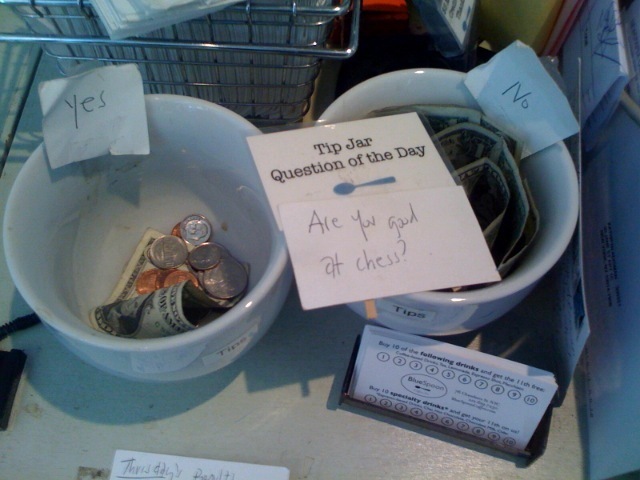 My friend Chris sent me this photo of the tip jars in the coffee shop below his office. Judging by the distribution of money, it seems that the shop is frequented by more woodpushers than masters. Or could it be that there are more (self-identified) good players than weak ones but the latter are better tippers? Chess educators have long hoped that the royal game would be universally taught in schools across the country. Today’s New York Times reports that Idaho will become the first state to offer a chess curriculum. Anecdotal evidence from a pilot program with second and third graders suggests that chess not only improves cognitive skills (concentration, planning ahead) but also emotional development. The children learned to be gracious in victory and mellow in defeat (lessons they may forget if they ever become grandmasters). Trust each other? Suspicion, not trust, seems to dominate relations between the world’s chess elite. This is a sport in which top players freely level cheating accusations at each other when things aren’t going their way. 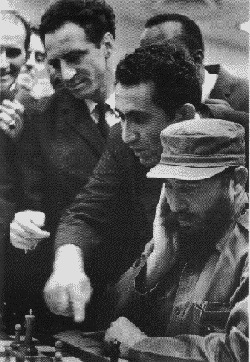 Speaking of heads of state and aspiring h.o.s’s who play chess, Fidel Castro was a stand-out. But judging from the surviving game score of a King’s Gambit he defended and won in 1966 (when the 17th world chess Olympiad was held in Cuba), he was more accomplished as a revolutionary than as a woodpusher. Away from the chessboard, Castro was certainly a master of defense. Yesterday I blogged about Heath Ledger’s interest in chess. In the past 24 hours, two interesting items on the subject have appeared in the mainstream press. From the Los Angeles Times: “For the last year, Ledger also had been gearing up for his directorial debut, working with veteran screenwriter Allan Scott on an adaptation of the Walter Tevis novel ‘The Queen’s Gambit,’ about an orphan girl who becomes a chess prodigy. Scott said they recently offered the part to ‘Juno’ star Ellen Page. Ledger played in chess tournaments as a child in Australia, but it has to be a tremendous exaggeration to describe him as close-to-grandmaster strength. The exaggeration would perhaps be excusable if it weren’t coming from the screenwriter who is turning one of the all-time great chess novels into a film. And the idea of the actor’s getting a grandmaster rating before filming can only be described as fantasy, albeit a delightful one, which fellow chess obsessives can appreciate. Heath Ledger’s talent as an actor was considerable: he has been compared to Marlon Brando and, with his earlier death, to James Dean. In Western Australia, where he grew up, he was a child actor, but he also exhibited many other talents, among them chess. MTV: I hear you play a lot of chess in Washington Square Park. Heath Ledger: Yeah. I’ve played since I was a kid. I play at least one game a day. Ledger: Yeah, they go hand in hand.